SAFE AND DURABLE- the bouncy horse is safe and durable. it can be a great gift for even for a 1-year-old boy or girl. it has been Third-Party Lab Tested and Certified Non-Toxic. Made from extremely durable, heavy-duty, Eco-friendly material. Soft rubber and Phthalate Free. EASY TO INFLATE- Supper easy to inflate. 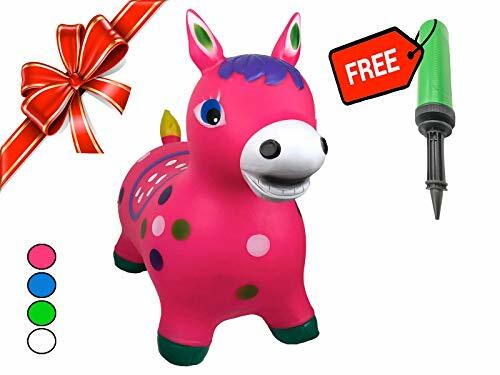 all you have to do to inflate these indoor and outdoor jumping animals is to use the pump that is included with the product. LEARN TO BALANCE WHILE HAVING FUN- Now your kids can have fun and learn at the same time with the help of the bouncy horse. your girls or boys will learn how to balance while they bounce and have fun. CUSTOMER SATISFACTION- CUSTOMER SATISFACTION IS KEY FOR US!!! if you are unsatisfied with the product or if you have any questions about it, message us, and we will do our best to assist you. ENJOY YOUR BOUNCY HORSE!!! Adorable! Bought as a gift for cousin but my kids had these and werena huge hit for years!!! !